A small Spanish team composed of two programmers and two artists is responsible for A Fistful of Cows, a free PC game developed as their final University project. 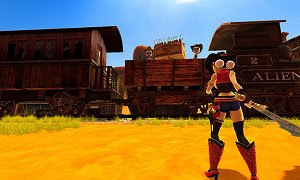 This action game features all the right ingredients to be a great success among the indie community: a cowgirl heroine with a generous bosom, colorful cartoon graphics with funny animations, competent game mechanics, a wacky story and addictive hack and slash gameplay. The story tells us of a UFO that abducts a few cows but wasn’t counting on the player, a fierce cowgirl, to chase the aliens with guns blazing and a sharp sword. Featuring 3D graphics, amazing visual effects and a third-person perspective, A Fistful of Cows also allows special shots with your revolver, freezing time to align the shots perfectly, for usually devastating results. Bosses, mostly, will require some bullets along with the sword fighting. A Fistful of Cows has another great idea that will surely put a smile on every player’s faces – the soundtrack features witty country versions of For Whom the Bell Tolls (Metallica) and Sweet Child O 'Mine (Guns ‘N’ Roses). It’s not a very long game but has an unusual quality.